A church over 130-years-old has opened its doors to the community by sharing its space and equipment – and its church warden wants others in the Kirklees area to do the same. The stunning St Paul’s Church in Mirfield, which took just one year to build in 1882, continues to be a tremendous place for people and groups to get together and hold activities and events, bringing the community together. And Having first borrowed items such as toys and games for children from our online platform for the Mirfield Arts Festival two-years-ago, Tim has continued to use Comoodle for a variety of projects such as The Carers Trust – a charity he is involved with. “We signed-up to Comoodle to get soft play items for the Carers Trust’s summer fair and since then, we’ve used them for St Paul’s which has been brilliant,” said church warden Tim. 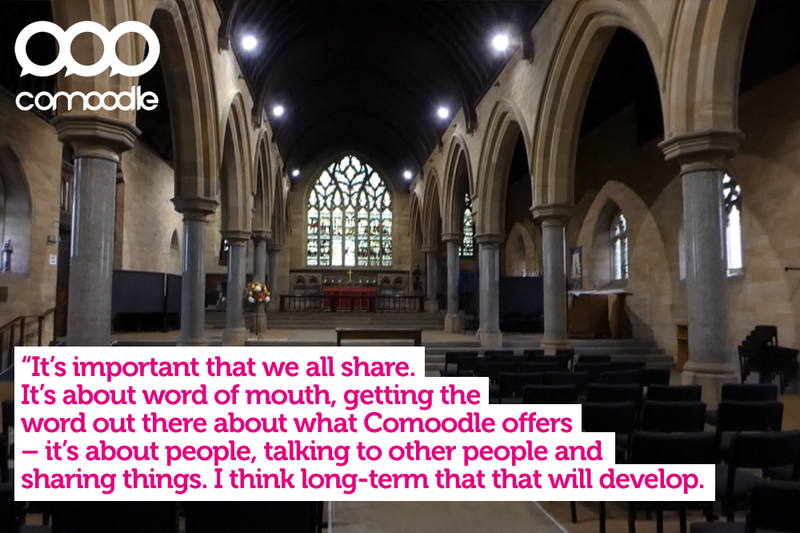 Tim is urging people, community groups and businesses to continue to use Comoodle and benefit from its range of shares – such as the community space in St Paul’s. “It’s important that we all share. It’s about word of mouth, getting the word out there about what Comoodle offers – it’s about people, talking to other people and sharing things. I think long-term that that will develop,” he said. “It was so easy to borrow these things that we need. When you’re spending time organising things, you wonder where you’re going to get the items and space from. The church’s main hall space has been made available and can hold from 51-250 people. It has disabled access and can be used for a range of activities from concerts to weddings. There’s also the community space which has a kitchen, holds between 11-50 people and is ideal for mother and toddler groups or community meetings. All the church asks for is a small donation to both spaces.